There are so many trails in the Blue Hills that are worth exploring. I'm only highlighting a portion of the Skyline Loop, but check out the full map for more trip ideas. The Blue Hills are a quick 20 minute drive from downtown Boston. Because of its proximity, you will have beautiful views of Boston from most of the hills. The Blue Hills are great for dog owners because the area itself is huge. You won't ever get bored in here because there are so many other trails you can take. Note that the park is not officially an off-leash park, although you may see dogs running around. Beware for dog owners: there are poisonous snakes (copperheads) in the Blue Hills. If your dog isn't snake trained, keep him leashed during the spring-autumn season! 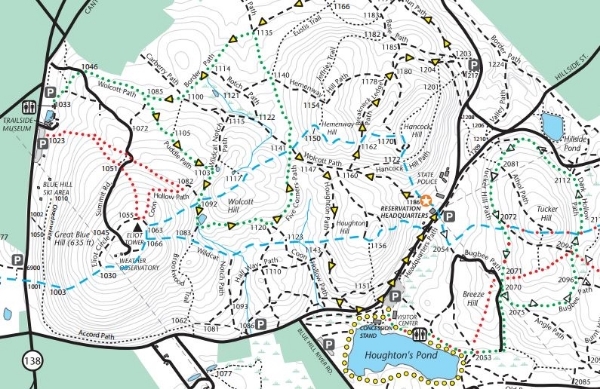 The Skyline Loop follows the blue markers in the above map. Parking at the Reservation HQ, follow the signs for the Skyline Loop heading left. The trail begins up a short slope and then flattens out for the next mile or so. Once you reach the North point of the loop, you will go up and down a few hills. In early November, there was still some fall foliage! The trails were not icy yet, but there were tons of leaves on the ground that can be slippery. We were lucky mid-November and had temps in the high 40s with lots of sunshine. Coming back around the loop, you will hit Elliot Tower. This place is a good spot for a light snack or lunch. Climb up to the tower for even better views! It's only less than a mile back to the Reservation HQ at this point. You will pass the Blue Hill ski lift (yes there are bunny slopes here in the winter!). On your way home, you can look at the animals and exhibits they have at the museum there. There's an otter here, but he was sleeping when we arrived. Note: this hike is in the "I-495" zone which means cell phone service works 100% of the time. This means you can carry a lighter pack, without GPS/Knives/Headlamps, etc.